available in different shapes, sizes and colours! Perfect performance - with or without hole. e.g. with your logo or slogan. Fits in every trolley with a 1-€ closure! It's hard to imagine life today without credit chips. Whether as a deposit chip, a beer token, tokens, drinks tokens, food tokens, tokens with monetary value, chemists tokens, meal tickets, shopping trolley tokens - these chips have made life simpler in many ways. As a manufacturer of tokens we not only assist you in the design of your credit chips, but are also a competent contact partner should any questions arise. 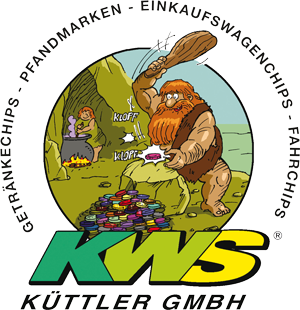 If you need drinks chips, beer tokens, deposit chips etc., then look no further than KWS Küttler GmbH. Our credit chips are made in Germany from high-quality PS (polystyrene). Your desired advertising texts are applied by means of permanent hot foil stamping with up to two colours. Our office will be closed from Dec. 24th 2018 – Jan. 1st 2019. Nevertheless orders and enquiries can be made in our online shop and will be answered Jan. 2nd. As a manufacturer of tokens we not only assist you in the design of your chips, but are also a competent contact partner should any questions arise. The credit chips, which are made from high-quality PS (polystyrene), can be ordered either with standard text or custom-made with your own personal design. To this end, you can choose from the following print types: hot foil stamping, digital printing or pad printing. Almost all products are "Made in Germany"! We focus on quality with a good price/performance ratio. The majority of the items in our online shop, and of course our credit chips as well, are made in Germany. This is indicated by means of a German flag beside the respective products. With us you get more than just credit chips and the appropriate accessories - you also get other products that are essential to your event. We also offer admission wristbands in various designs, balloons, finger food tongs, drinking cups, cloakroom tokens and much more. You can browse the product categories in our online shop 24/7. You are not bound to any opening hours and can order your products while sitting on your couch in the comfort of your own home. Should you have any questions we will be happy to help, via telephone or email. Queries submitted via our query form or via email on working days are responded to within 24 hours. Queries received between 7:00 and 15:00 are generally responded to within 2 hours. If your query reaches us at the weekend, you will receive a response from us by Monday at the latest (excluding holidays). Pay in your usual and most convenient manner. We accept payment by PayPal, advance payment, cash on delivery or payment on invoice (Unfortunately we cannot accept payment on invoice for orders from abroad or with a goods value over € 350. We ask for your understanding in this matter). We guarantee the professional processing of your order regardless of which payment method you choose. Stock goods - ordered today by 11:00 - sent on the very same day – this applies to many of our products. As a rule, packages will be with you by the next day. Should you require guaranteed next-day delivery, there are numerous options to choose from when checking out, from next-day delivery to delivery by 10 o'clock. Accurate delivery times and information can be found for each individual product. We also deliver custom-designed products within the shortest period of time. Feel free to give us a call and we will let you know the expected dispatch date. We are also happy for you to arrange the collection of products directly from us.